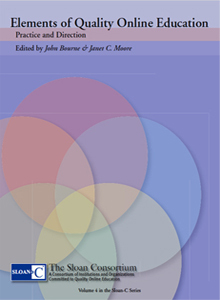 Elements of Quality Online Education: Practice and Direction, Volume 4 in the Sloan-C series (2002) provides an overview of the status of online education, examples of effective practices, and directions for research and development. Volume 4 also addresses these questions: What pedagogical practices promote effective learning online? What are the key areas for achieving cost effective quality in online programs? What services enable new populations of learners to access higher education? What motivates faculty satisfaction in online teaching? What practices assure student satisfaction? Available also in PDF format. Elements of Quality Online Education: Practice and Direction, Volume 4 in the Sloan-C series (2002) provides overviews of the status of online education, examples of effective practices, and directions for research and development. Volume 4 addresses these questions: What pedagogical practices promote effective learning online? What are the key areas for achieving cost effective quality in online programs? What services enable new populations of learners to access higher education? What motivates faculty satisfaction in online teaching? What practices assure student satisfaction?